A few weeks ago I was sent a copy of the newly published Pomegranate and Roses cookbook by Ariana Bundy to review. Let me begin by saying how exciting it is to see Persian cuisine cookbooks being published, which means putting our delicious food further on the map. I liked the title of the book immediately as it is representative of two of the beloved Iranian flavors. I completely understood where she was coming from and could relate. Just like her, when I first started cooking Persian food, I knew very well what each dish should taste like, however, I simply did not know how to make them because no one taught me either! I made three recipes from this cookbook including a dessert, a stew, and an omelette. The one that stood out was Omeleteh Khorma which is a delicious omelette made with dates. Bundy provides both stove top and muffin pan directions. 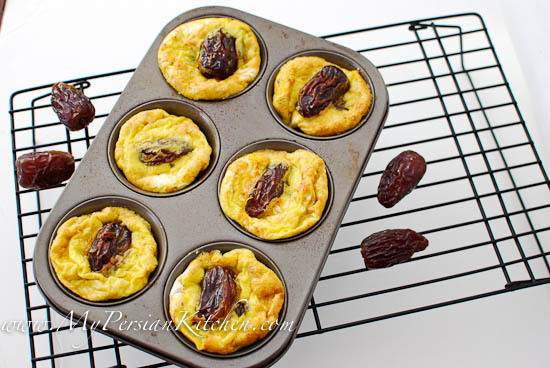 Opted for muffin pan option and these omelette muffins provided a nice breakfast and/or snack along with a nice cup of steaming Persian Tea! 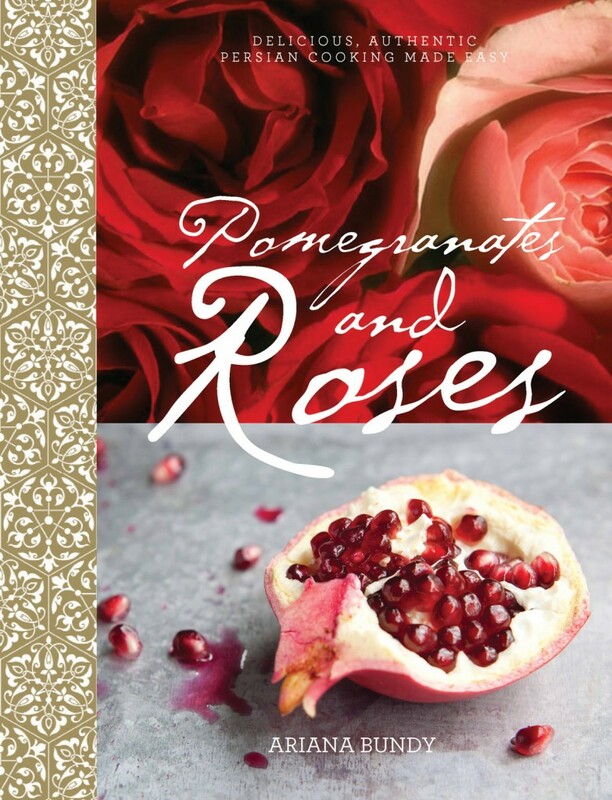 Pomegranate and Roses features a variety of recipes from all over Iran. The recipe category ranges from appetizers, main courses such as stews and rice dishes, desserts, jams, and pickles. There are definitely a lot of recipes to choose from. Another appealing aspect of this cookbook is the author’s childhood memories of her time in Iran which appear in between the recipes throughout the book. Pomegranate and Roses: My Persian Family Recipes is currently available for purchase. Cookbook provided for considerations by publisher. Amazon Affiliates link included within post. Oh dear, another beautiful cookbook to add to my list! I like the idea of muffin-pan omlettes – is it just a case of adjusting the cooking time? I got this book as a Christmas gift, and just made the recipe for Date omelet (loved it). I’ve been reading your blog for a few years now, and was happy to see you reviewed the book here! I have no family links with Iran (except my name perhaps), but I have emotional ties with that part of the world, which I try to express through teaching myself how to cook dishes from that part of the world. Your blog is a true inspiration, with so much advice and images, thank you so much! Happy New Year!